Any quantity only $1.99 per oz over spot! The collection of Geiger Original Bars from Geiger Edelmetalle may have an “old” name to it, but these silver and gold bars are anything but ancient. 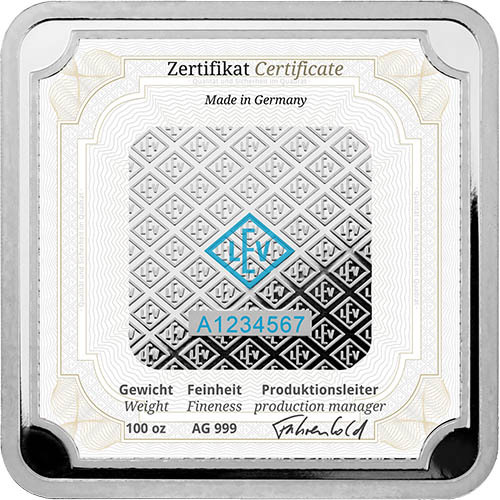 Each piece of silver for sale from Geiger Edelmetalle in this release has classic design elements that mesh with the latest in anti-counterfeiting design elements to produce the most secure bullion investment around. The 100 oz Silver Geiger Square Bar is now available to you for purchase online at Silver.com. Ships to you in individual protective plastic or sealed in boxes of 8 bars! Consists of 100 Troy ounces of .999 fine silver. The castle Schloss Guldengossa appears on the bar’s obverse. A repeating pattern of the LEV rhombus appears on the bar’s reverse. Refined by Geiger Edelmetalle in Germany! Geiger Edelmetalle’s most iconic design element is that of its Baroque-style castle which serves as the company’s corporate headquarters. Castle Schloss Guldengossa was constructed outside of Leipzig, Germany in 1720 and eventually became the first registered corporate location of Geiger Edelmetalle when it became the corporate headquarters. 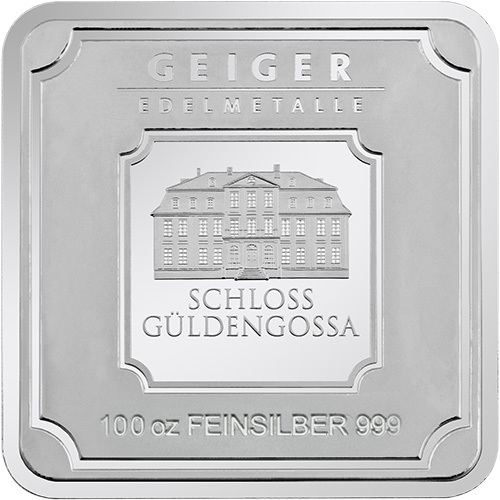 The castle of Schloss Guldengossa features prominently in many silver bar designs from Geiger Edelmetalle, including the new Geiger Original range. These bars are available in silver from 1 Gram up to 5000 Grams, and in gold from 1 Gram up to 1000 Grams. Each bar in the range has a pearl finish on the obverse, ribbed edge similar to bullion coins, and a high-relief, textured reverse finish. On the reverse of the 100 oz Silver Geiger Square Bar is the design of an LEV rhombus captured in a repeating pattern across this side of the bar. There is also a block at the bottom that has a stamp of the serial number, which is shown in a one-letter, seven-number digit sequence. This side of the bar also includes a UV coating which, under black light, displays a central LEV rhombus and highlights the serial number. The obverse of the bars in the Silver Geiger Square Bar collection have the stamped image of Schloss Guldengossa. The castle was originally built near Leipzig, and its original owner was friends with the famed composer Johann Sebastian Bach, himself a precious metals enthusiast. In addition to the image of the castle on this face, there are engravings of “Geiger Edelmetalle” at the top and the bar’s weight, metal content, and purity at the bottom. Geiger Edelmetalle is located near the Saxon mountains in southern Germany. This region of Germany has been a silver mining hub for more than 1,000 years, with Geiger opening its doors in 1218 to refine and process silver from the region. We encourage Silver.com customers to contact us with questions at 888-989-7223. You can also connect with us live online using our live chat service or email address.